Doctoring the ANBAD Donkey picture has now become the highlight of my week. I think I need to realign my priorities. 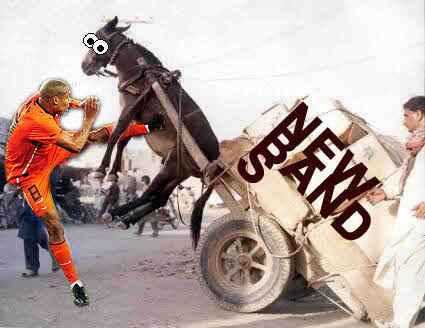 Still, here’s the final World Cup-related picture for four long years, and what wonderful synchronicity that Nigel de Jong’s joke tackle in the World Cup Final was a picture-perfect shoe-in for some DONKEY VENGEANCE. FIRST! Superhumanoids have made a bundle of slow-burning songs that might make your hairs prick up. How they program robots to do that I don’t know. Persona is an iron robo-fist enveloped in a velvet glove – understated, shimmering, cool. SECOND! Stop The Wheel‘s songs are as fun as I remember 1980’s kids’ TV shows to be, before they tried to be cool and ‘connect’ with the viewers. Their song BMX is a brilliant, hell-for-leather pre-pubescent rush. Remember, however hard you try, as an adult, you’ll never again experience the feeling of exhilaration you used to get from whizzing around on a bike. So this song will be as close as you get. Savour it, suckers. THIRD! The Firsts – ironic scheduling, hey? This band is half-Finnish, and I love Finnish bands more than life itself. Does this mean that I only half-love this band? Well, no. The splicing together of the two cultures has produced a hybrid, perhaps, and the outright craziness that seems to typify Finnish music is missing a bit, but frankly, the Firsts rock too hard to care. FINALLY! Not Squares were on ANBAD before and enraged, delighted and puzzled me in equal measure. The perfect combo. Here is their brilliant new song, with equally brilliant new video. A pleasure, never a chore. DONE! And done. Kung fu! Posted on July 14, 2010 by Joe Sparrow. This entry was posted in Headline, Today's New Band. Bookmark the permalink.